A quality handset in places that will do well with the intended targets - but don't expect anyone to swap an iPhone for it. Update: We've now re-reviewed the phone based on the lovely lower price of £99.95 ($240) - does it make it more of a bargain in the face of the incoming BlackBerry 10 smartphones? With all of this talk about the new OS and the internal politics at RIM, it's easy to forget that the manufacturer is still churning out phones in the hope that punters will buy one. And until BB10 arrives, we have BB7 smartphones to enjoy - especially on this latest little handset, the BlackBerry Curve 9320, which is pocket friendly in terms of both price and physical size. While BlackBerry has been busy pumping out impressive touchscreen handsets such as the BlackBerry Bold 9780 and BlackBerry Bold 9900, it's keen to make sure it doesn't alienate those who would be drawn in by its cheaper - yet just as cheerful - Curve range. And the BlackBerry Curve 9320 - just like the BlackBerry Curve 9360 - fits that mould well. The BlackBerry Curve 9320 looks like a Curve of old. It's sleek, with both black and brushed metal tones and has a curved back, which really fits in the hand well - almost as though it's been moulded with that in mind. It was one of the first things we noticed when we took it out of its packaging. At 109 x 60 x 12.7mm and 103g, it's a bit thicker than the Curve 9360, and 4g heavier, and certainly feels rounder and more chunky. The precise edges are gone. It's more Playskool to the Curve 9360's Prada - but that will suit some down to the ground: namely, the younger generation this is clearly aimed at and those who are coming to a smartphone for the first time with little regard for aesthetics. The front holds the screen, which is a fairly basic 320 x 240 pixel job measuring 2.44 inches. The 164 ppi density won't blind you with its greatness, but it does the job reasonably well. We used to view this as amazing on devices of old. Now, we feel more hard done by. 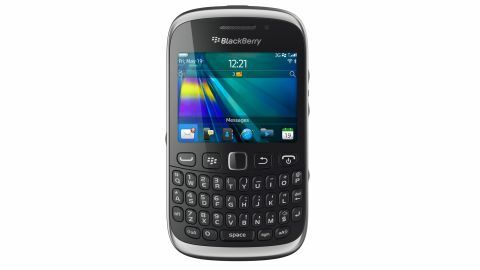 Also, the BlackBerry Curve 9320 isn't touchscreen but you do get RIM's signature optical trackpad beneath it to navigate. This is surrounded by the four standard BlackBerry buttons (call, menu, back, hang up), and they're all mechanical rather than touch-sensitive. The actual keyboard is typical Curve fare, with small keys that give a satisfying, tinny click when pushed in. Round the back, you'll find little of interest other than the 3.2MP camera and LED light. The actual rear of the phone is made of shiny black plastic. We couldn't help feeling it looked a bit cheap, and thankful that the shape of this phone fits the hands so well. If not, this shiny rear would be taking you straight to slipsville. Up top, you'll find the 3.5mm headphone jack and an unlock button. There are no dedicated media buttons but there is a dedicated BBM button on the left, which is something we're not used to seeing. That's accompanied by the charge/sync port. The right-hand side has the volume buttons and convenience key, which is set by default to fire up the camera. Both can be easily changed to open your app of choice. The BlackBerry Curve 9320 is one of a number of handsets in the BlackBerry Curve range, including the BlackBerry Curve 9360, BlackBerry Curve 8520 and BlackBerry Curve 3G. It will be competing foremost against them. The BlackBerry Curve 9320 is free on contracts from as little as £10.50 per month, and is now priced at around very palatable £99.95 on Pay As You Go in the UK to also target young and first-time smartphone owners. Of course, pricing in the US will differ.